Alexander I or Aleksandar Obrenović (Cyrillic: Александар Обреновић; born: 14 August 1876 – died: 11 June 1903) was king of Serbia from 1889 to 1903 when he and his wife, Queen Draga, were assassinated by a group of Army officers, led by Captain Dragutin Dimitrijević. Alexander was born on 14 August 1876 to King Milan and Queen Natalie of Serbia. He belonged to the Obrenović dynasty. In 1889, King Milan unexpectedly abdicated and withdrew to private life, proclaiming Alexander king of Serbia under a regency until he should attain his majority at eighteen years of age. His mother became his regent. His parents were second cousins. In 1893, King Alexander, aged sixteen, arbitrarily proclaimed himself of full age, dismissed the regents and their government, and took the royal authority into his own hands. His action won popular support, as did his appointment of a radical ministry. In May 1894 King Alexander arbitrarily abolished King Milan's liberal constitution of 1888 and restored the conservative one of 1869. His attitude during the Greco-Turkish War (1897) was one of strict neutrality. In 1894 the young King brought his father, Milan, back to Serbia and, in 1898, appointed him commander-in-chief of the Serbian army. During that time, Milan was regarded as the de facto ruler of the country. In the summer of 1900, King Alexander suddenly announced his engagement to the widowed Madame Draga Mašin (born on 11 September 1864 with full name: Draginja Milićević Lunjevica), formerly a lady-in-waiting to his mother and 12 years older than him. Draga was foremely married to Svetozar Mašin. The proposed union aroused great opposition: not only was Draga of unequal birth and obscure family, but at 36 years of age, the chances of her bearing an heir were slim. Alexander was an only child, and it was imperative to secure the succession. Before making the announcement, Alexander did not consult with his father (commander-in-chief of the Serbian army), who had been on vacation in Karlovy Vary and making arrangements to secure the hand of German princess Alexandra zu Schaumburg-Lippe for his son, or his Prime Minister Dr. Vladan Đorđević, who was visiting the Paris Universal Exhibition at the time of the announcement. Both immediately resigned from their respective offices and Alexander had difficulty in forming a new cabinet. Alexander's mother also opposed the marriage and was subsequently banished from the kingdom. She was known to have been seen in the nearby countries, such as Austria-Hungary and Bulgaria. Opposition to the union seemed to subside somewhat for a time upon the publication of Tsar Nicholas II's congratulations to the king on his engagement and of his acceptance to act as the principal witness at the wedding. The marriage duly took place on 05 August 1900. Even so, the unpopularity of the union weakened the King's position in the eyes of the army and of the country at large. The conspirators searched the palace and eventually discovered the royal couple and murdered them in the early morning of June 11, 1903. King Alexander and Queen Draga were shot and their bodies mutilated and disemboweled and, according to eyewitness accounts, thrown from a second floor window of the palace onto piles of garden manure. Draga's two brothers, Nikodije and Nikola, were executed by firing squad on the same day. Both brothers were serving as army officers at the time of their sister's marriage and appear to have been unpopular with their peers. The King was only 26 years old at the time of his death. King Alexander and Queen Draga were buried in the crypt of St. Mark's Church, Belgrade. Serbia KM#21 1 Dinar. Year: 1897. Weight: 4.93 g [5.00 g]. Metal: 0.835 Silver. Diameter: 23.00 mm. Edge: Reeded. Alignment: Coin. Mint: Vienna, Austria. Obverse: Crown at the top. 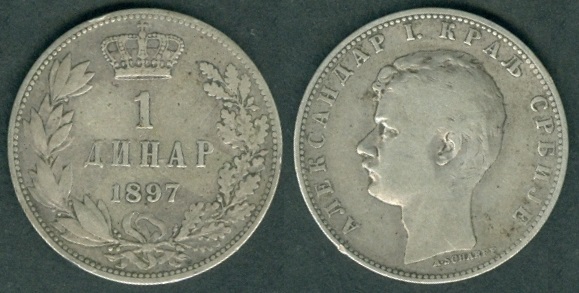 Numeral "1" in the center with "ДИНАР" (Dinar) written below. Date "1897" below the Value. Wreath surrounds the Value and Date. Reverse: Alexander's portrait facing left in the center. "АЛЕКСАНДАР I. КРАЉ СРБИЈЕ" (Alexander I, King of Serbia) written clockwise around the portrait. "A•SCHARFF" written below the neck. Mintage: 4,001,000. Mintage Years: One year type. Engraver: Anton Karl Rudolf Scharff (both sides). 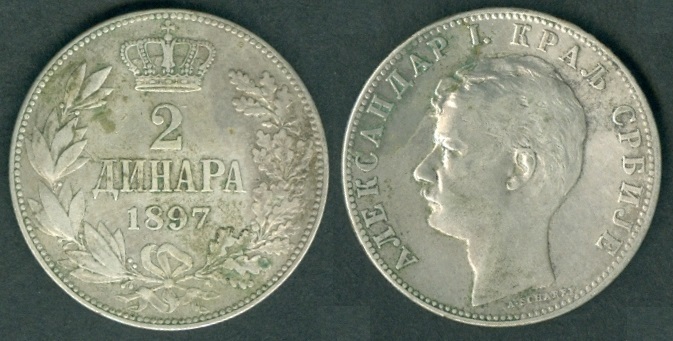 Serbia KM#22 2 Dinara. Year: 1897. Weight: 9.93 g [10.00 g]. Metal: 0.835 Silver. Diameter: 27.00 mm. Edge: Reeded. Alignment: Coin. Mint: Vienna, Austria. Obverse: Crown at the top. Numeral "2" in the center with "ДИНАРА" (Dinara) written below. Date "1897" below the Value. Wreath surrounds the Value and Date. Reverse: Alexander's portrait facing left in the center. "АЛЕКСАНДАР I. КРАЉ СРБИЈЕ" (Alexander I, King of Serbia) written clockwise around the portrait. "A•SCHARFF" written below the neck. Mintage: 1,000,000 + N.A. Proofs. Mintage Years: One year type. Engraver: Anton Karl Rudolf Scharff (both sides).